Nimrod, the son of Cush, had an impact on ancient Israel unmatched by any other of Ham's descendants. Cush, the oldest son of Ham, fell under the Noahic curse. Consequently, the descendants of Cush, Nimrod included, would fall under the curse as well. The son of Cush's name literally means "Let us rebel". Cush felt threatened by Noah's prophecy of servitude, and consequently sought to establish his own kingdom through his son. Ham had laid the groundwork for open rebellion against his father Noah. He had resented Noah's authority, and in effect, God's authority. This attitude trickled down to his son Cush. Cush, in turn, raised his son in a spirit of rebellion against God and His plan for mankind. He would become the founder of the very empire which would one day completely destroy the nation of Israel and its Temple, and send its people into exile. This empire would, in due course, come to represent the satanic government set up and established in Revelation to pursue and utterly destroy all Jews and Christians from the face of the earth. "And Cush begat Nimrod: he began to be a mighty one in the earth. He was a mighty hunter before the Lord: wherefore it is said, Even as Nimrod the mighty hunter before the Lord. And the beginning of his kingdom was Babel, and Erech, and Accad, and Calneh, in the land of Shinar." Click on the link below to jump to that section of this page. View the comments of others, and post yours! As the descendants of Ham moved into Arabia and Africa, Cush and his clan choose to settle in the Tigris-Euphrates River Valley. By the time the son of Cush had come of age, he had established himself as a "mighty one in the earth".
" He was powerful in hunting and in wickedness before the Lord, for he was a hunter of the sons of men, and he said to them, 'Depart from the judgment of the Lord, and adhere to the judgment of Nimrod.' Therefore is it said: 'As Nimrod the strong one, strong in hunting, and in wickedness before the Lord.' "
The spirit of rebellion is seen clearly in Ham's grandson. He has no desire to pursue the commandments of God. 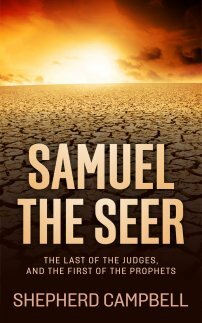 Instead, in an effort to thwart the Noahic curse of servitude, Cush had raised his son in the hopes of establishing their own kingdom on earth, and perhaps even enslaving the descendants of Shem and Japheth. Nimrod was without a doubt a man of great charisma and ability. He held tremendous influence over the people. It is noted that he was a "mighty hunter before the Lord". Such a phrase would seem to indicate hunting above and beyond the normal hunting required to gather food for one's family. Throughout the Old Testament the Bohemath and Leviathan appear sporadically, indicating that extremely large animals were present in Old Testament times. Some geologists and scholars claim that the Ice Age immediately followed the Genesis flood , and fossil records from the Ice Age, and pre-Ice Age (before the Flood), indicate that enormous animals existed, perhaps even dinosaurs, or some ancestors of them that found their way onto the ark. As the environment changed due to the flood, the food supply would have changed as well. Animals that were used to abundant supplies of food before the flood, perhaps found it hard to survive on the limited food supply after the flood. These fossil records indicate that enormous animals were in fact living around this time. These animals may have been a serious threat to man in the centuries following the flood. Any person that gained a reputation as a Big Game Hunter in those times would surely have gained fame and popularity among men. However, this ability was taken and used "against the Lord". He hunted and killed these animals in a heart of deliberate and open rebellion towards God. Perhaps he viewed his killings as a way to establish his control over God's creation, thus his independence from God's sovereignty. Cush had taught his son that God was against their side of the family, and it was up to him to save his lineage from enslavement and humiliation. It was by his prowess as a hunter that fame and honer were obtained, and ultimately he rose to a position as a world leader of his time, using his charisma, ability, and energy to establish an empire, centered in Babel. God had given Noah and his sons the order to establish human government, but the kind He intended was a far cry from what Ham's descendants would build and establish. The Babylon mentioned throughout the entire Bible, from the captivity and destruction of Israel in 586 B.C., to the Babylon of the book of Revelation, is the Babel built and established in Genesis. This was truly a government set up against God, and everything God represented. Www.israel-a-history-of.com wants to provide you with opportunities for further study by providing resources from our sponsors, available for your purchase. Give us your thoughts and feedback on the products we offer through our advertisers by clicking on the Contact Us tab to the left. We hope you enjoy the world of Nimrod and the Tower of Babel! The Chaldeans settled in Ur, home of Abraham. This was also the land of the empire established by Nimrod. Add this invaluable resource to your collection today! Steven Merrill dives into the history and background of the mysterious hunter/builder. He brings to life the distant and remote times of ancient Mesopotamia, and one of the most mysterious characters in all of the Bible! These people built a vast network of cities and religious complexes, centered in Babel, or Babylon. The Mighty Hunter built Erech, called Uruk in the Bible. Erech is 100 miles southeast of Babylon, and was the legendary home of Gilgamesh. 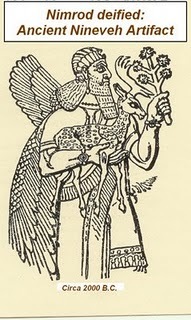 Gilgamesh was the hero of the Babylonian flood story. Archaeological excavations at Erech have produced ancient writings that date long before Abraham . Immediately north of Babylon, was Accad. Accad is also found throughout the Bible and other ancient texts spelled Akkad, and Agade. The Akkadian Empire lent its name from this city. The Akkadian Empire is practically the same as the Sumerian Empire. Calneh has yet to be identified, however it was in the land of Shinar. The "land of Shinar" is most likely Sumer, and referred to in Daniel 1:2 as Babylonia. From Babel, he worked his way up the Tigris River into Assyria. His plan of expansion was in motion. He sought to establish great cities on each river, the Tigris and the Euphrates, in an attempt to control trade and commerce in the region. Approximately 200 miles north of Babylon, on the upper Tigris river, he founded Nineveh. As Babylon was situated on the Euphrates, Nineveh was situated on the upper Tigris, and later became the capital of the Assyrian Empire, just one of the eventual conquerors of Israel. Along with Nineveh, he built the cities of Rehoboth, Resen, and Calah. NIMROD'S EMPIRE CENTERED AROUND MODERN DAY BAGHDAD, IRAQ. HE BUILT UP BABEL & NINEVEH. HE WAS ALSO A GREAT HUNTER. CLICK HERE TO POST YOUR THOUGHTS What insights might you provide this topic? 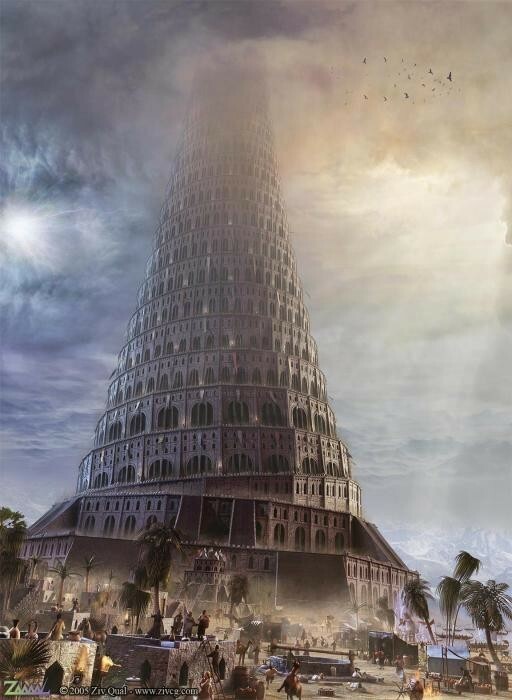 What do you think about the Tower of Babel? Please give us your thoughts, comments, and questions by clicking on the above link! Rehoboth and Resen were satellite cities of Nineveh, yet have not been identified. Twenty miles south of Nineveh, on the banks of the Tigris, rests the excavated ruins of Calah. Calah is still called "Nimrud" after its founder. Resen was said to have been built between Nineveh and Calah. These cities taken together were known as "a great city". Nimrod, in essence, became the originator of the Metropolitan are. The Assyrian myths and legends tell of a "Ninus" that founded Nineveh and the "great city". Linguists and scholars agree that "Ninus" is a form of "Nimrod". "Now the whole world had one language and a common speech. As men moved eastward, they found a plain in Shinar (That is, Babylonia) and settled there. They said to each other, 'come, let's make bricks and bake them thoroughly.' They used brick instead of stone, and tar for mortar. Then they said, 'Come, let us build ourselves a city, with a tower that reaches to the heavens, so that we may make a name for ourselves and not be scattered over the face of the earth." As he built up his vast network of cities, both on the Tigris and Euphrates rivers, he began to institute religious practices that were directly at odds with the worship of the true God. The passage in Genesis 11 tells the story of Nimrod's efforts at establishing a world religion. Though Nimrod's name is not directly mentioned, the Tower of Babel was built in Babylon, presumably under his direction. As Nimrod was a "mighty one" among men, and the founder of the Babylonian Empire, it is natural to assume that he was the driving force behind man's rebellion in those days. It is interesting to note that the passage states, "As men moved eastward".. The plain of Shinar is located southeast of Ararat, thus, this may suggest that people first migrated to the far southeast of Mt. Ararat into Persia or Afghanistan. Perhaps Nimrod even led a rebellion that broke from the main body, and led his group westward into Babylonia. Though there is no factual basis for this, it is an interesting thought, and certainly not out of character for Nimrod to rebel and try to establish his own kingdom. 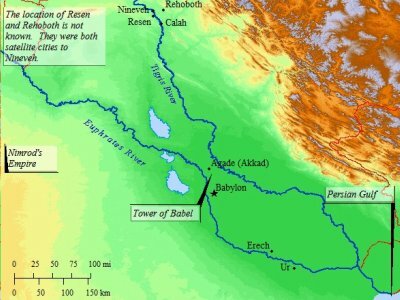 By the time of the Tower of Babel, his kingdom is well established with major cities (Nineveh & Babel) on both the Tigris and Euphrates rivers. Perhaps once they settled, then Nimrod rose to prominence. Whatever the course of events, by this time Nimrod was firmly in control of the region. It is worth noting here that archaeology has revealed that the bricks used in ancient Babylon were stronger and more durable than those used in ancient Egypt and Assyria. The Egyptians and Assyrians used the sun to dry their bricks, hence the term "sun-dried brick". The Babylonians used a kiln of sorts. Their bricks were furnace-treated, thus stronger and more enduring. They also used bitumen instead of mortar. The "tar" mentioned was probably the slime found in the asphalt pits of the Tigris-Euphrates valley. Kiln-fired bricks and asphalt construction were very common in ancient Babylon, and agree with this passage in Genesis. Once they had established their construction methods, Nimrod sought to establish his legacy by building a tower in honor of man. They no longer were concerned with worshiping the Creator. Romans 1:18-32 gives a vivid description of what life must have been like for Nimrod and his followers. So corrupt and evil had this generation become that Revelation 17:5 calls Babylon "the mother of prostitutes, and of the abominations of the earth". This perversion led to Pantheism, the belief that Nature and God are in essence the same, and Polytheism, the religious system which establishes multiple gods. This was in direct opposition to Monotheism, which is the worship of one God. Judaism, Islam, and Christianity are all forms of monotheistic belief systems. There is plentiful evidence to suggest that all forms of paganism, meaning all forms of pantheism and polytheism, traces its roots back to Ancient Babylonia. It is no secret that the assortment of gods and goddesses from Egypt, India, Greece and Rome all find their beginnings in the original pantheon of the Babylonians. There is even evidence that Nimrod himself was later deified as Merodach, or Marduk, the chief god of Babylon. This may be the origin of Pharaoh and Caesar worship seen in later empires, where the leader of the particular empire is claimed to be a god. Naturally the stars, and planets, the "heavenly host", became involved with these deities and pagan practices. The sun began to occupy a central place of importance. The zodiac was created. Astrology became perverted, and led to spiritism, and soothsaying, and using the stars to predict events and dates in the future. This perverted religion of creation-worship ultimately led to Baal worship, Zoroastranism, and any other form of worship that seeks to praise the creation, rather than the Creator. "....and a tower, whose top may reach unto heaven...". The reason for building this tower was not to reach the heavens, but to honor heaven and its angelic host. The word "unto" suggests an offering, and this tower was an offering to heaven and its host. It would serve as a temple, a central altar, where man could offer sacrifices and worship. This tower would dominate the city. It would be the crown jewel, architecturally, culturally, socially and spiritually, of the empire. It would be a symbol of man's unity and strength. Nimrod instituted governing bodies of priests to regulate and oversee worship. Verse 8 suggests that though the tower was not finished, it was in use at the time when God came down to look in on the construction. Ornate decorations would have adorned the ceilings and staircases of the temple. Emblazoned scenes of stars and heavenly bodies filled the empty spaces in the ceremonial rooms throughout. The stars began to assume identities, such as Leo the great King of Heaven, and perhaps these identities were shown in sculptures and statues that lined the staircases and doorways of the tower. he beauty of the tower was surely breathtaking. In fact, so impressive was the Tower of Babel that God Himself commented, "now nothing will be restrained from them, which they have imagined to do". As a result, God saw it necessary to scatter the people to prevent further corruption and moral degradation. To accomplish this, God confounds the language of the people. The word "confound" is the Hebrew Balal, and means mingled, or mixed, and by extension confusion. The English word "babble" is an example of an onomatopoeia, a word formed to imitate an actual sound. The very name Babylon would come to represent the city of babbling, or confusion. Babylon, in fact, has since been a center of religious and political confusion. Babylon was an ever constant threat to Ancient Israel, both spiritually and physically, and continues to be a threat to this very day. Do you have an opinion on Nimrod? What are your thoughts on the Tower of Babel? Share Your Thoughts and Comments here! All images and pictures must be in .jpg or .gif format. The Tower of Babel was built in East Africa. The word 'Babel' has the original meaning of Bab=gate and El=God. It was the builders' hope that they were building a gateway to heaven. The True Nimrod and Tower of Babel in The Bible. Babylon ( the whole world system of falsehood ) is doomed! GOD says not to partake of the error. Jesus is the truth. Amen. How long did Nimrod build up Babel?